On Saturday, roughly 51,000 protesters took to the streets for the thirteenth consecutive weekend but the numbers were down from January. Once again, the demonstrations were marked by violence, with one protester severely wounded in the hand. Now heading into its fourth month, the unrest has cost the French economy billions of dollars in lost tourism and commerce, and morphed from anger over a fuel tax hike to include broader social and economic grievances. Named after the trademark yellow security vests French citizens keep in their cars, the gilets jaunes or yellow vest movement is igniting similar protests elsewhere in Europe—even as some French unions and parties are eager to co-opt it. Last week It even helped to turn long-simmering tensions between France and Italy into a full-blown spat with Paris withdrawing its ambassador to Rome for ‘consultations,’ following a meeting between Italy’s deputy prime minister and yellow vests. Some protesters claim they are driving a new French revolution—over old grievances, but also more recent reforms pushed by the government of President Emmanuel Macron. But their movement risks being splintered by its myriad demands, lack of clear leadership, and infighting within its ranks. Upcoming European Parliament elections may deepen the divisions, with purists maintaining the movement should stay out of politics. Yellow vest protester Sabrina Drljevic-Pierre (R) wants greater social and environmental justice. 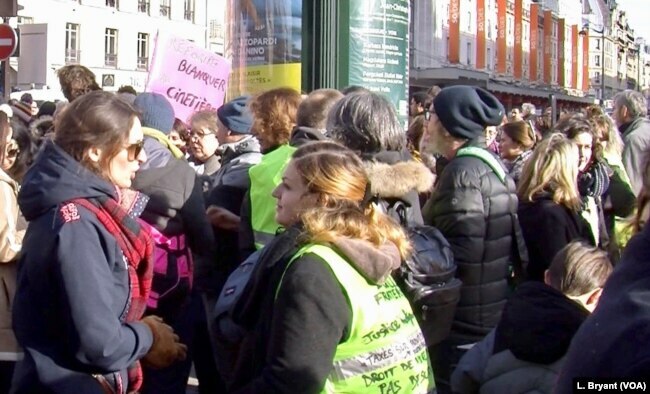 For the first time last week, yellow vests joined forces with leftist trade unionists in a nationwide strike for higher salaries and a fairer tax system. They packed central Paris on a sunny afternoon, marching to Place de la Concorde, known for its many executions during the French Revolution. For many the symbolism was potent. Nearby, protester Jerome Partage agreed the French president and his government must go. 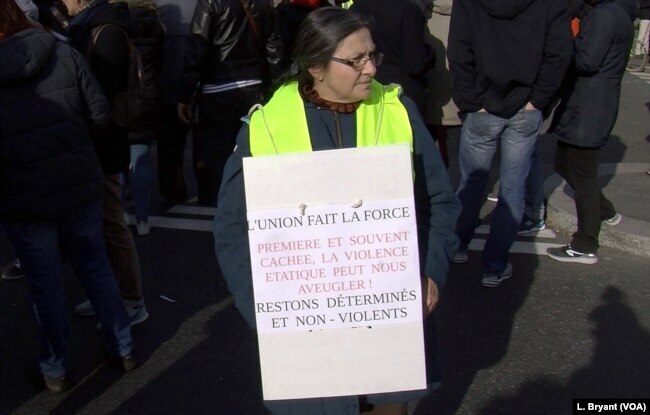 A yellow vest protester calls for less violence but for demonstrations to continue. For the 41-year-old Macron, the ongoing protests easily amount to the biggest crisis facing his two-year-old presidency, and risk derailing a series of ambitious reforms. With his approval rating hitting record lows, the president did a U-turn late last year, repealing an unpopular fuel tax hike, and announcing pay rises and tax cuts for the most vulnerable. Macron also acknowledged he was partly to blame for what he described as an ‘insufficient’ government response to yellow vest frustrations, a startling break for a president critics routinely describe as arrogant. And he sketched a partial blueprint for unwinding the crisis: three months of national debates, aimed to get citizen input on themes ranging from taxes and public services, to climate change and democracy. Macron’s popularity has since inched up. But there does not appear to be a clear objective behind the raft of town hall meetings scheduled through mid-March that could potentially include millions of French. Among other outcomes, the president is mulling a referendum, possibly piggybacking on the European parliament vote in May. 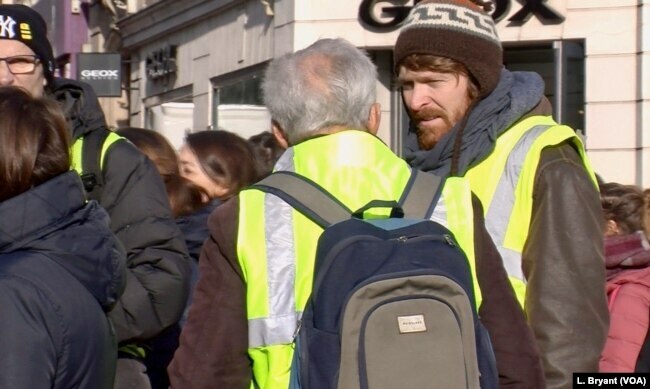 The yellow vests encompass all ages and many backgrounds. But that option is risky. The last referendum saw voters delivering one of Macron’s predecessors, Jacques Chirac, a massive setback in 2005, by rejecting a European Union constitution. And on the streets, there appears to be little support for either a referendum or Macron. Still, the yellow vests face their own challenges. Several are eyeing a run for European parliament. Initial polls suggest they could score well. But so far, the movement has produced no unified list of candidates, and some members believe it should stay out of politics altogether. Retired school teacher Jean-Francois Wolff is also underwhelmed by prospects of a yellow vest party. But as he prepared to join yet another protest, he was at loss to predict how the uprising would end. The post Yellow Vest Protests France – No End In Sight appeared first on iAfrica.com.